"The first performance of Debussy's PELLÉAS ET MÉLISANDE in 1902 made a major impact upon Inghelbrecht and he was to be associated with the music of that composer throughout his life. Jacques Rouche engaged Inghelbrecht as conductor at the Theatre des Arts in 1908, where he directed the first performance of Florent Schmitt's LA TRAGEDIE DE SALOME, and in 1911 he was chorusmaster for the stage premiere of Debussy's mystery-play with dance, LE MARTYRE DE SAINT SEBASTIEN; he later conducted with distinction its revival as a concert piece in 1912. In order to give Paris a first-class choir, Inghelbrecht founded the Association Chorale Professionelle in 1912 and in the same year was appointed director of music at the newly constructed Theatre des Champs-Elysees, where he conducted the theatre's opening season productions. These included Berlioz's BENVENUTO CELLINI, Mussorgsky's BORIS GODUNOV, and Dukas' LA PERI. 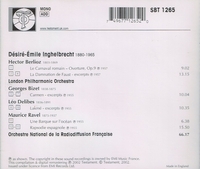 After World War I, in 1919 Inghelbrecht founded the Concerts Pleyel with the objective of performing the music of the seventeenth and eighteenth centuries. He toured Europe with the Ballets Suedois between 1920 and 1923, conducting the first performances of LES MARIES DE LA TOUR EIFFEL by Les Six, and Milhaud's L'HOMME ET SON DESIR (both in 1921) and on his return to France became chief conductor at the Opera-Comique, Paris (1924-1925). He then held a succession of posts - second conductor at the Concerts Pasdeloup (1928-1932), chief conductor of the Algerian Opera (1929-1930), and once again chief conductor at the Opera-Comique (1932-1933) - before embarking upon his major achievement: the formation in 1934 of the top radio orchestra in France, the Orchestre National de Radio France, of which he was chief conductor until the liberation of France at the end of World War II. He continued to conduct this orchestra until the end of his life, including on tour to England in 1953, even during the years (1945-1950) when he was chief conductor at the Paris Opera. Inghelbrecht knew Debussy well, and specialised in the performance of his music throughout his career. He recorded works by Debussy both before and after World War II, on 78rpm and long-playing records, keeping alive a style of interpretation which he sedulously maintained to the end of his life. His performances of Debussy's music were direct and precise, and without any hint of 'impressionism'. His own compositions, especially those written when he was young, clearly showed the influence of Debussy. Among the most well-known of his works are LA NURSERY, composed between 1905 and 1932, the ballet EL GRECO of 1920, and the REQUIEM of 1941. He also wrote several books on different aspects of conducting."